﻿Recordings of classical repertoire in the Fifties and Sixties were made during a time of technical development, which is hardly given a thought in our day with its global digitalisation and mass reproduction. To appreciate the improvement offered by stereo recording technology over even high-quality mono recordings, one can do no better than listen to the present rendition of Beethoven’s Symphony No. 3, which was recorded on the threshold of transition. 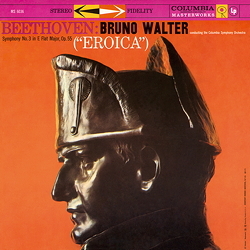 Bruno Walter and his handpicked Columbia Symphony Orchestra present this major orchestral work with its heroic, revolutionary character as a grand symphonic undertaking. Thanks to the new studio technology, Beethoven’s 'new path', and his daring experiment with musical form and content is revealed with previously unheard of depth and amplitude. Just how prudently Walter approaches the score is shown again and again in the highly detailed reconstruction and finely chiselled rendition of passages for small ensembles. Instead of depending upon brusque contrasts of the elements, Walter’s conducting concentrates on exposing the wealth of differing styles and tonality in the score. This strategy of balancing out the contrasts blazed a trail for today’s unremitting search for the much-heralded original sound.nical rights have been paid.